Cool Photo of the Week: Chilly! It’s not just humans that find the doctor’s stethoscope is too cold when we go for our checkups. This is Yakini, a newborn gorilla, being examined at the Melbourne Zoo, in Australia. Look at her face. I think we all know that feeling! Just ten days left to send us a video of YOU being the very best gorilla you can be! It doesn’t have to be fancy - use your webcam or your cell phone, and video yourself imitating gorilla behavior. You can read Seymour’s GORILLAS book for ideas. The deadline for entries is December 31st, so don’t delay. Grand Prize winner gets a free Seymour Simon Skype session with your class, and the top videos will be featured for all to see on SeymourSimon.com. Click here for details on how to enter. Come on - show us your inner gorilla! Christmas came early this year for gorillla conservation experts. A census that counted endangered mountain gorillas in their African habitat shows that their number has grown by more than 25% since 2003. This is big news because just 30 years ago we were down to 250 mountain gorillas, and scientists believed that the species was in danger of extinction. Scientists who did the census this spring found 480 mountain gorillas (Gorilla beringei beringei) living in 36 groups, plus 14 solitary silverback males. They live in a huge park called the Virunga Massif which spans three countries - the Democratic Republic of Congo, Rwanda and Uganda. The governments of these nations are credited with working hard alongside wildlife conservation groups to protect the gorillas by policing poachers and protecting against accidental snaring by local hunters. "The mountain gorilla is the only one of the nine subspecies of African great apes experiencing a population increase. While we celebrate this collective achievement, we must also increase efforts to safeguard the remaining eight subspecies of great apes," said David Greer, African Great Ape Coordinator at the World Wildlife Fund (WWF). You can learn more about mountain gorillas in my book, and visit the International Gorilla Conservation Program website to learn how you can help. Look at this entry in Seymour’s Go Gorilla! Contest. This is Olivia doing her best imitation of Gorilla behavior. What a cutie! If you or your class haven’t yet entered, it’s easy. No fancy video equipment needed — you can even use a cell phone that records video. Then click on the “Send Us Photos/Video” link at the top of Seymour’s home page. The instructions are clear and simple (we designed it that way, so that a kid can do it!). This contest only runs through the Fall semester, so enter now to win personally autographed Seymour Simon books, have your video showcased on the website for the world to see, or if you’re the Grand Prize winner, a Seymour Simon SKYPE session (that’s a conversation over computers, using a web cam) for your class. You’ve got to be in it to win it. Study up on gorilla behavior, point your camera and GO GORILLA! Enter the GO GORILLA Contest! Just in time for Back to School we are running a funny contest on SeymourSimon.com. We want to see entrants "Go Gorilla!" by uploading videos of themselves imitating real gorilla behavior. The Grand Prize Winner earns a free Seymour Simon Skype session with their class — now there’s a way to get in good with your new teacher! And, there are lots of other great prizes. o THIRD PRIZE: Twenty randomly chosen videos will receive personally autographed photographs of Seymour Simon. 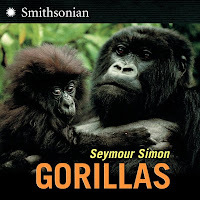 o SECOND PRIZE: Ten randomly chosen videos will receive personally autographed copies Seymour Simon’s GORILLAS book. o FIRST PRIZE: The top five best videos will be posted on the Seymour’s website for everyone to see. There is nothing to lose, and a lot to win! Click here to find out how to enter, study up on what gorillas do, and send us your video today!! Gorillas and humans share 98% of their DNA. Now is your chance to show how similar our species really are! First, find an example of gorilla behavior online [see examples below]. Then, submit a short video of you imitating some aspect of gorilla behavior-its walk, its sounds, facial expressions, and more. No costumes are required - in fact, they’re discouraged. The Prize: An autographed copy of Seymour Simon’s new Gorillas book! Your video also gets posted on the SeymourScience Web site! In case of ties, more than one prize will be given.